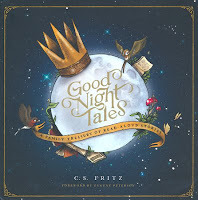 This fully illustrated children's book is a collecection of 12 stories that represent Bible stories or parables, written with animals or forest creatures as the characters. The theme weaving the 12 stories together is that there is a glorious King who loves us. Each story has a scripture reference printed above the title. Every page is illustrated to help make the story come alive. In the back of the book there are discussion prompts for each story so you can use the stories as devotions or just for further discussion and learning with children. As I read the stories aloud to my grandchildren it was fun to watch their faces for the moment they connected to what Bible story was being retold. A complimentary copy of this book was given to me by the publisher for the purpose of review.